Late Autumn is generally the time that most people begin lifting their maincrop potatoes for storage. Potatoes are a Winter staple in my house, so it’s important that we get as long a life out them as possible. Here are 7 tips for effective storage of your potato harvest. Hopefully you’ll still be enjoying this year’s potatoes well into 2015! When digging potatoes, always use a fork. This reduces the amount of potatoes you damage, and stops you slicing straight through a handsome prizewinner. I used to do this loads, but now I gently loosen the soil with a fork, before scraping away with a trowel. If you can find a nice, sunny day to harvest then all the better, as potatoes benefit from a few hours of drying out before storage. Lay them on the ground in a nice warm position, and then roughly clean the mud and soil off the skin. You don’t need to be too fussy with this though. Don’t use water to clean your potatoes though as dampness can cause the stored potatoes to rot. Pick out any potatoes that are damaged or the skin is broken (including the ones you might have just put your fork through!). They’re fine to eat but not store, so set them aside for a few forthcoming dinners. Store your potatoes is in paper or hessian sacks. Hessian is great as the potatoes can breathe, and stops them from sweating and becoming damp. This helps prevent the spread of rot. Don’t use plastic bags for storage, as the potatoes will condensate and rot. You only need a couple of rotting potatoes to quickly ruin a bag full. Exposing potatoes to light can make them go green, meaning you run the risk of them giving you a stomach ache. If you do get green on your potatoes, cut it away before preparing. The rest of the potato will be fine. Light can also cause the potatoes to sprout, which means they won’t keep as long. They’re still good to eat though; just pull the shoots off before cooking. Optimum temperature for long term storage is between 5° and 10°C. If you haven’t got a shed on your allotment or in your garden, under the stairs is a good alternative. Resist refrigeration though, as that is much too cold for your prized tatties. 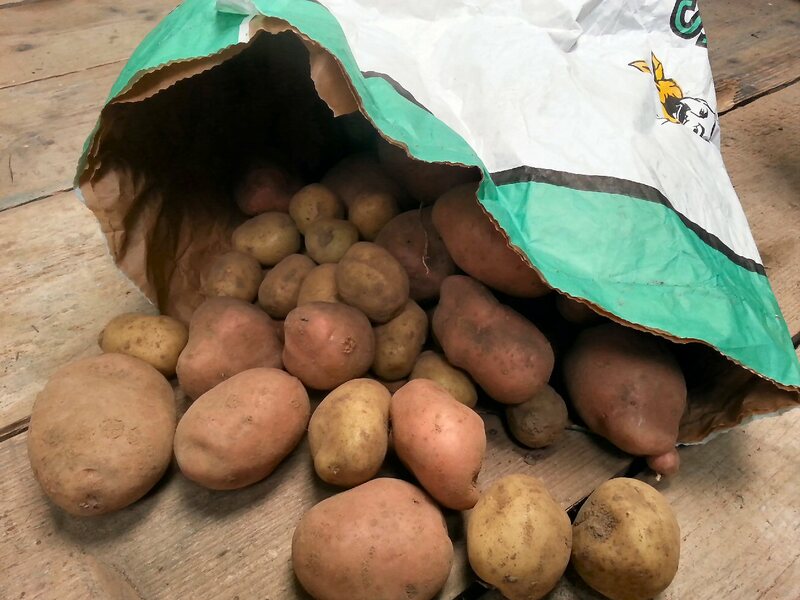 Make sure you check through your potatoes regularly during the winter, in case any in the bags have started to rot. Remember to dig as deep as you can! Finding a rotting one at the bottom of the bag can be an unpleasant surprise, but removing decaying potatoes will prevent the spread of rot within your stored harvest. Can You Leave Potatoes in the Ground? During lazy or busy years, I have left my potatoes in the soil into November. As long as the soil doesn’t become soggy or suffer a frost, then from my experience the spuds are quite content. Don’t leave it too late before digging up though, the ground can get soggy very quickly once Winter sets in.